With software for creating landscape visuals readily available, we at YardKit made a paper product — even though we’re based in Silicon Valley, rely on the web to sell our wares, and have years of experience working solely on computer programs to finish landscape design projects for the likes of Google and Stanford. Here’s why. When I was in grad school earning my Masters in Landscape Architecture (an MLA), our professors spent the entire first year of our three-and-a-half-year program teaching us to draw by hand. It felt antiquated at first, etching graphite lines on giant desks outfitted with bulky Mayline contraptions and a bevy of drafting tools we’ve never seen before or since. While the architecture industry around us was posting jobs for AutoCAD drafters and awarding highly polished competition graphics, we were using the same special-order-only contraptions for measuring and drawing that Frederick Law Olmsted relied on during the late 1800s. Though this anachronistic instruction started to make a lot more sense once we ventured nearly full-time into the computer lab every semester after. The rationale became clear: drawing lets you think. When you have a pencil in your hand, you can immerse yourself into that outdoor space you care so much about, and start to imagine its potential. Computer programs — even three-dimensional ones, like SketchUp, help you see and test an idea from a particular angle, but they don’t create an idea. A pencil does. A yard has many puzzle pieces — planting areas and their individual plants, patio or deck spaces and their furnishings, driveways, and walkways and their materials, structures, and features and how they fit in — that need an overarching strategy to all fit together well. By thinking of your property as a whole map, you’ll be able to connect the dots between all of these pieces to make a clear outline that guides all the other decisions you’ll have to make when renovating. 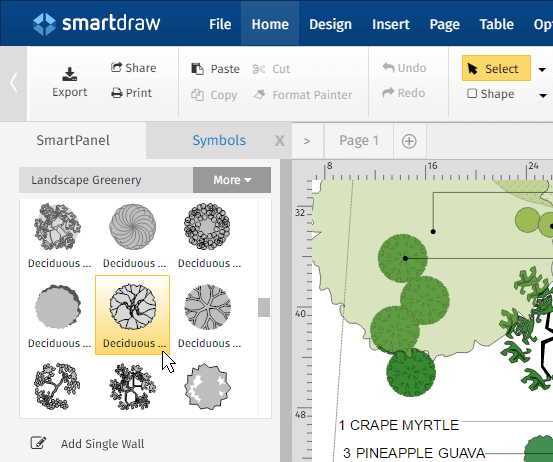 Landscape design software programs get to the details of these puzzle pieces quickly. Most offer lovely visualizations of changes you can make by moving around specific plants or fixtures. They don’t, though, guide you through your yard with the eye of a designer to see what should stay and what should go, what will really fit or won’t, and how you and your family will really want to use your outdoor space. Once these pieces are in place, the dots connected, software programs are a great tool for imagining and testing the specifics. Before diving into any program (and believe me, we’ve given them all a whirl! ), you still need to know what you’re working with and what you want to accomplish. Measuring the size of your property, taking inventory of key features, exploring ideas with your family, and pulling together a realistic action plan is what YardKit does. We take you through an easy process of getting to know your yard — its size, microclimates, what should stay or go — and offer lots of ideas for making a dreamy space. A computer program’s library of thousands of individual furnishings or plant species is overwhelming if you don’t yet know how big you want your deck or planter boxes to be, or where plants will have the sun or shade they need. Adding individual shrub symbols to your property plan before you know whether that overgrown back corner should be a vegetable garden or firepit area is a recipe for disaster. Once you have your puzzle assembled at the end of our proven process, you’ll be armed and ready to use the computer program, and its library of thousands of plants or light fixtures, without feeling overwhelmed or like you’ll end up tearing them out in a few years. Many software programs rely on side views, or elevations, as their visuals, and look exclusively at plants. A contractor or gardener needs much more than this to begin building — they’ll need a plan that identifies areas of different uses and materials, one YardKit will leave you with. At YardKit, we hear folks tell us they’re afraid of drawing when they hear about this process. We get it — we made an analog product in the digital age. It does feel scary, like staring down a blank piece of paper when a report is due or picking up a new instrument you’ve never played. Though I began to wonder why so many folks are afraid of trying. Sure, it’s a new skill for many, but it’s also an adventure (and one that will save you thousands of dollars in professional design fees and construction changes). And, like the novice skydiver with an instructor strapped to her back, we’re with you at every step. Curious when we all got afraid of our imaginations, I asked my four-year-old niece to draw her favorite parts of her yard and what she wished it had. She illustrated the tufts of green grass, an oversized blade of uncut grass, a sprig of lamb’s ear, and then layered in a field of pink grass she wished were there. Her drawing may not be an action plan for exterior renovations, but, to her, looking out the living room window at an expanse of cotton-candy-colored lawn would be a vast improvement. We're all for using any tool that will help make landscape renovations easier. Before you dive into the details, though, don't be afraid to try imagining an idea of your own. 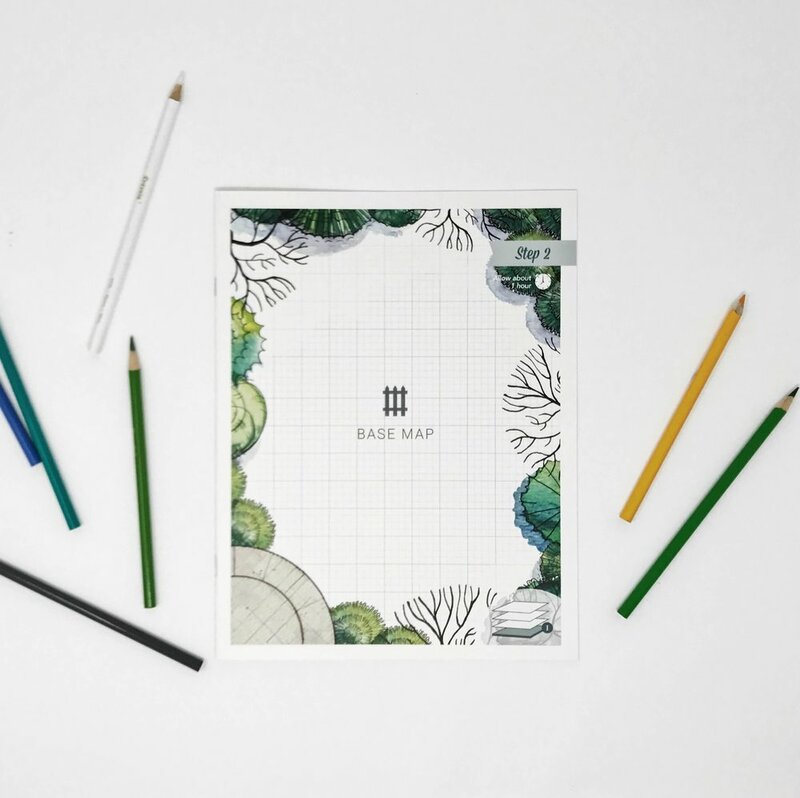 Just pick up your pencil, get some fresh air, and trust the YardKit process.